There’s something wrong with A.J. Burnett. That news doesn’t come as any great shock to Yankees fans, or anyone else who pays any attention to baseball. But rarely can you find the exact point in a season when a player suddenly, mysteriously seems to lose the ability to play baseball. In Burnett’s case, we can. How does a guy go from less than a hit per inning to being hammered nearly every time out? Ordinarily, you would look for something physical. In AJ’s case, that isn’t the problem – he routinely hits the mid-90’s with his fastball, which is on par with his career velocity. The second most common cause is something mechanical – but AJ’s mechanics look to be the same now as earlier in the year. His pitches still have plenty of bite and movement. And he’s actually striking more hitters out per 9 now than in April. That leaves something causing AJ to lose focus and concentration. If you don’t think that can serious problems for a pro athlete, ask Tiger Woods. Tiger is known as one of the most disciplined athletes ever, yet his personal life (and distractions) have caused his game to deteriorate to mere mortal status. AJ has always been an emotional guy; the kind of guy who wears his heart on his sleeve. If you’ve watched him lately, he seems robotic, emotionless; not the AJ Burnett we’re used to seeing. He’s gone from a pie-throwing, fun-loving #2 starter to an emotionless DFA candidate. The Yankees know Burnett’s stuff is too good for him to be getting hit at nearly a .300 clip. Burnett does, too and I have to believe that deep down, his recent performance is tearing him up. Whatever happened on May 5th that turned AJ’s season upside down, it behooves them to find out and see if it can be fixed. Not only won’t they win a pennant with AJ pitching like this, but they have him under contract for 3 more years. Before this turns into another Carl Pavano or Kevin Brown contract, they need to get AJ back on course. ROGER CLEMENS IS IN GEORGE’S BOX AND ROGER CLEMENS IS COMIN’ BACK. OH MY GOOD–GOODNESS GRACIOUS! OF ALL THE DRAMATIC THINGS–OF ALL THE DRAMATIC THINGS I’VE EVER SEEN, ROGER CLEMENS STANDING RIGHT IN GEORGE STEINBRENNER’S BOX ANNOUNCING HE IS BACK! ROGER CLEMENS IS A NEW YORK YANKEE! Now, I’m sure you could come up with a lot more. If you want me to add more to the list, feel free to drop more in the comments section below. What was the State of the Yankees over the last five years? Did Joe Torre break the code of what happens in the clubhouse should stay int he clubhouse? Jim Bouton doesn’t think there is any clubhouse sanctity anyway. When you become a professional baseball player..you are open to criticism and you will be written about. Bouton believes that most of the things being said in the book is stuff fans already know. He was also laughing at the diea that a player would actually feel violated by the book. Can anybody tell me what we learned from the book? If you think about it..most of this stuff we already knew. Wells and Torre clashed, Brown and Pavano were bums, Steinbrenner was crazy and Cashman and Torre had different views on some topics. I just watched Joe Torre on ‘Larry King Live’ and I thought Joe put things in perspective. If you listen to what he says..it really seems like the media blew the book out of proportion. He wasn’t really attacking anyone, but he wanted the readers to further understand what was really going on during those 12 years. Doesn’t mean it’s not a good book, or it’s not interesting, but everyone jumped on Torre and started bashing him. I took notes on the interview, so those who missed it can see what Larry and Joe talked about. CNN also had live blogging of the interview where people were submitting questions to Joe. Tom Verducci and Joe decided to write this book two years ago. This was all decided before he left the Yankees organization. He wrote it to encompass the 12 years he spent in New York. Both the good times and the bad. The book tells people the changes that went on. How the Red Sox changed their style of business and the steroid era. He didn’t want to shock people with the book. He thinks that people will always resent some of the things said, but it’s the truth. Joe wanted to share his story and feelings during his tenure with the Yanks. He says that he wants his reputation to be honest, and that is exactly what the book is. Why soil your own legacy? Joe said he doesn’t think the book takes anything away from his legacy. If you keep it in context..you will appreciate the book. It was just an inside peak of what went on. He thought it added personality to the players, and helped the readers relive those golden years. Did leaving the Yankees make you feel bitter? He said he can’t look back on those years with the Yankees and be bitter. The years he spent with the club was wonderful. Did you violate “the code”? He really dodged this question. He went on to talk about Boomer, and how he felt about the comments he made. Joe said that David and him always had that sort of relationship. They respected each other professionally. Joe asked him to come to his dinner which honored the 1998 Yankees..and he David responded by saying: I don’t like you, but I’ll go. Haha. That’s Boomer for ya. Joe talks how Kevin Brown and David Wells drove him crazy. He said he didnt’ have anything against Brown, and that he actually liked him because he tried to do well. Torre said that Brown didn’t leave room for any mistakes and was hard on himself. He then started to talk about A-Rod. He said that Alex is a special player, and that there is no other person more talented then him. Baseball is A-Rod’s life. He didn’t want Alex to be “the guy” all the time. He wanted Rodriguez to be himself. Fans were only interested in wins, while Alex wants records and statistics. – Joe said that he puts a great deal of pressure on himself, and he tried to help him out. – Alex didn’t have problems with teammates. – Torre said that the A-Fraud thing was more of a joke..that was said right in front of him and not behind his back. Did Rodriguez have a conflict with Jeter? Joe said no. They weren’t best friends, but they acted like professionals. What do you think of A-Rod’s divorce and Madonna? The divorce surprises him. He also understands that he’s a lightning rod, and that gives him a great deal of attention. Is Alex Rodriguez a minus to the Yankees? Joe said no. He spoke about Alex coming into NY, and how everything he does draws attention. – He thinks the ’01 World Series was the greatest of all the ones he managed. With those 3 amazing nights..and especially since it was after 9/11. – Joe gets along fine with Many Ramirez. He described him as a fun loving guy. He spoke about how Manny scared him to death when he was the manager of the Yankees. He hopes Ramirez returns to the Dodgers this upcoming season. Think it will effect your players right now? Do you think you were burning any bridges? No. He didn’t think there was any sensitive material in the book that he felt shouldn’t have been in there. – Watching some of the World Series clips gave him goosebumps. He wanted to share those moments. Joe said that without the bad times..it wouldn’t be an honest book. – His last year with the Yankees was very difficult. He said it was mutual and he needed to move on. When did you last speak to Alex Rodriguez? He hasn’t spoken to him since he left NY. He said that nothing in his book should make Alex angry. You never got trust from the front office? That bothered you. Are you angry inside? He said the front office didn’t trust him, but he isn’t angry inside. Joe said that Steinbrenner was always cracking the whip and he wanted to be in control. He wasn’t able to enjoy what he did for very long, because Steinbrenner was always thinking about the next thing. Joe went on to say that it’s worth the price you have to pay. When you get an opportunity to win..you pay the price for it. 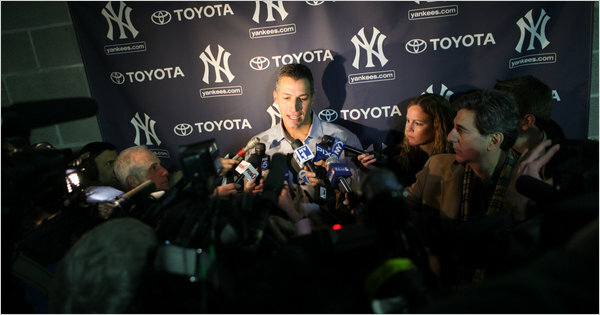 Did you feel betrayed when you left the Yankees? No. What bothered him was that they gave him a one-year deal with incentives. He felt that it wouldn’t change anything, and the club thought it would make him a better manager. It wasn’t about the money, but the thought that he needed motivation bothered him. Did you sign an agreement with the Dodgers since the book has come out? No he hasn’t. Torre says that this isn’t the first time this idea has come up. The Yankees have asked him before about not writing a book. He never agreed to anything. Torre likes to believe that it is only retracing his years spent with the Yankees. Joe is shocked by the initial reaction, but he’s not upset. He thinks that once people read the book..people will further understand exactly what went on. What did you say about Steinbrenner? Joe said that George would be proud of things he said. Georgie was proud to be the boss. It wasn’t criticism, but he was just describing him. Torre said that George got him the players, and that he couldn’t have done it without him. -Steinbrenner talked about giving out no bonuses to the coaches after the Yanks beat the Mets in the WS. After new years eve…he called them and changed his mind. Joe said that Steinbrenner just wanted to get their attention..
What are your thoughts of a Yankees/Dodgers World Series? He said it would be wonderful to play in a World Series again. He smiled at the idea of Manny facing the Yankees again. Betrayed by Cashman not in the book, but was implicated…? How do Dodgers fans compare to Yankees fans? He said it is hard to duplicate what went on in NY, and that you could feel the heartbeat in the Bronx. He said Dodgers fans were Lukewarm in the beginning, but when they went on to beat the Cubs..they got very excited. Joe put Yankee Stadium in a class by itself. Joe was asked if he would run for President? He didn’t say no. Haha. He likes Obama. He thinks he is very bright, but people need to have patience. Was the book purely monetary? Will money go to charity work? Not monetary. They were both paid for writing the book. Who is the most purely gifted athlete? A-Rod. He said that Alex can do it all..hit for power, hits to the opposite field, plays great defense, etc. What went on with Gary Sheffield? He said that Sheffield was always suspicious person and that he had mood swings. They had a good relationship, but he called him out once for not hustling. Joe said that he was treated fairly. What did you know about steroids? He said he never saw it..never talked or heard about it. Joe said he never went in a players locker and respected players privacy. Joe said that everyone is to blame for the steroid era. Did you speak to Giambi about Steroids? He said that they spoke around it. He was hesitant to approach him, but he wanted to make sure he was okay. He thought that he wasn’t the person who should be asking those questions, because they could have changed his livelihood. How are you doing Joe? He talks about overcoming prostate cancer. He was first diagnosed in 1999..and 10 years later..he is doing fine. He said that cancer is not something you cure, but you try and extend your life as much as you can. -He like LA. His daughter was first upset about the move, but she made adjustments. -He said he doesn’t think he said anything bad about Bobby Abreu in the book. Haha. Other reactions to Torre / Logistically, Yanks can’t sign Dunn or others? Joe Torre book fills the winter vacuum / SAY IT AIN’T SO, JOE!!! New Yankee Stadium light display..
What are your thoughts on Joe Torre now that he has released his new book? Yanks to take Swisher and Nady to Spring Training? More teams have shown interest in Nick Swisher than Xavier Nady, but it’s possible now that the Yankees take both players to spring training. After getting Pettitte back so cheap, they don’t appear to be in quite the rush to unload one of the outfielder’s contracts. While Swisher may be drawing interest, the value of Nady, who outhit Swisher by quite a bit last year (.305 to .219), has to be much higher. I guess this will be one of the many major stories this off-season, and I don’t see this stopping any time soon. This book has become very controversial, and people have different opinions on it. Not only will he be on Letterman, and doing his book signing at the Yogi Berra Museum, but he will also be on Larry King Live this Friday. I think the only way you can judge Torre is after you read the book. Most people are just taking stuff from headlines and bashing Torre. In his first public comments since excerpts from his book, “The Yankees Years,” began to surface over the weekend, Joe Torre told The New York Times on Tuesday that he is prepared to answer for the contents of the final product. In the book, a third-person collaboration with Tom Verducci, Torre touches on a variety of controversial topics — among them, his dealings behind closed doors with Alex Rodriguez, general manager Brian Cashman and more. “Knowing that my name is on it, I know I’m going to have to answer for it,” Torre told the Times in a telephone interview from Hawaii, where he is on vacation. That the Yankees of the former manager’s final six seasons were a self-absorbed, overpaid imitation of the famously gritty bunch that brought him four rings in his first six years. “It was just not an unselfish team,” Torre says of the revelation that hit him in 2002. “He’s the best player that I’ve had a chance to play with,” Mussina told The Post. “And he works hard at it and if he sat around and worried about everything that happened, he wouldn’t be able to be the player that he is.